NKJN is a five-year, $10 million collective impact project led by Thorne that provides pre-k to high school, backyard to backcountry, and family integrated environmental education and outdoor recreation programming to underserved Lafayette youth. NKJN is also building parks and trails to ensure all Lafayette youth live within a safe 10-minute walk to nature. CLICK HERE to go to the Nature Kids/Jóvenes de la Naturaleza Lafayette website. 1. To ensure all Lafayette youth live within a safe 10 minute walk to nature. 2. 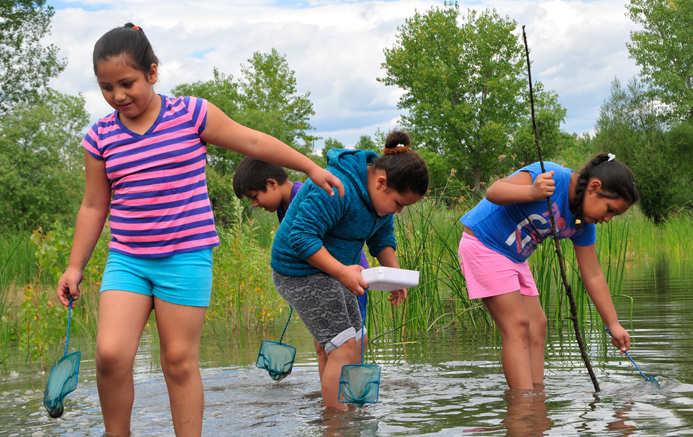 To connect youth to nature through a continuum of pre-k to high-school, backyard to back-country, and family integrated programming. These goals will be achieved over five years by a collaboration of thirty-nine partnering nonprofit organizations, public agencies, and local businesses led by Thorne Nature Experience. 82 separate programming components to be carried out over five years and six capital construction projects to build new parks, trails, and recreational amenities have been designed as part of the NKJN program to address community members stated needs and desires. Programming components include in-school opportunities and field trips for elementary school age youth, for credit academic classes and after school clubs and paid employment opportunities at the middle and high school grade levels, summer camps, and a progression of family nature experiences that include day-long and overnight trips to hike, camp, and participate in the outdoor recreation activities. The capital construction projects will bring nature to the Alicia Sanchez Elementary and Escuela Bilingua Pioneer schoolyards, create parks along the Coal Creek Trail Corridor, and create linkages between low-income neighborhoods and parks and open spaces through new trails, bike-lanes, and pedestrian street crossing and widened sidewalks. The total NKJN program is valued at $10.5 million. CLICK HERE to go to the Nature Kids/Jóvenes de la Naturaleza website.